The economic and financial crisis has inflicted severe disruptions on the European and global economy. This has been reflected in a significant retrenchment of private investment, mounting public indebtedness and rising unemployment. Since the start of 2014, growth gradually started to pick up. While we are currently seeing stronger cyclical growth with rates at around 2%, the EU's capacity for long-term economic growth remains too low. In order to boost long-term growth and competitiveness, we urge policy-makers to continue implementing labour and product market as well as institutional reforms that make EU economies and the EU as a whole more productive and resilient. Policy-makers should ensure that regulation is well designed and properly enforced, with a minimum of administrative burdens. Given signs of emerging supply constraints on labour markets, improving work-orientated learning for all age groups, promoting digital skills and implementing reforms which help encourage people to stay longer in the workforce must be ensured. At EU level, all available instruments must be coordinated and mobilised to better prioritise competitiveness and sustainable growth. In particular, the EU must address fundamental barriers to growth by achieving a truly integrated single market, taking forward plans to build a Capital Markets Union, completing the Banking Union and removing remaining obstacles to investment. Member States in turn need to improve their record of implementing structural reforms and create a regulatory environment that encourages business investment and competitiveness. Delays in necessary reforms mean that we are losing ground with global competitors. 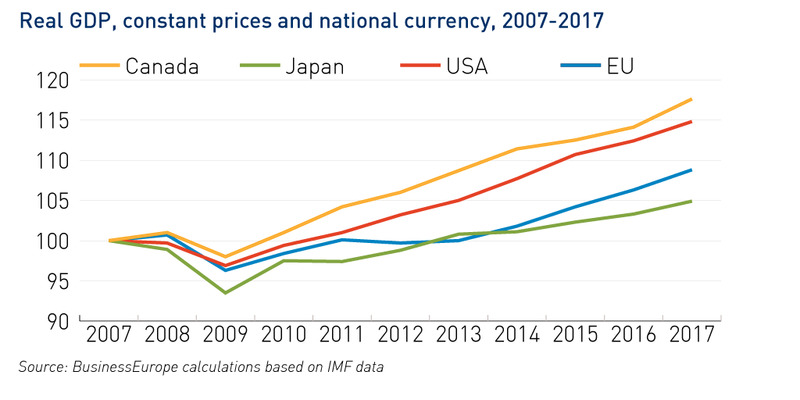 If we make a comparison to 10 years after the crisis, it is clear that the EU’s recovery proceeded at a particularly slow pace compared to that of other major economies (see chart). In 2017, EU output was 9% above pre-crisis levels, compared to 15% in the USA and 18% in Canada. The underlying EU’s capacity for long-term growth, without reform, is only 1.3% - thus well below its current ‘cyclical’ growth of close to 2% (OECD estimate). This compares to potential growth estimates of 1.5% in the USA and 0.7% in Japan. Alarmingly, potential growth fell strongly by 0.7-0.8 percentage points in both the EU and the USA over the last ten years.